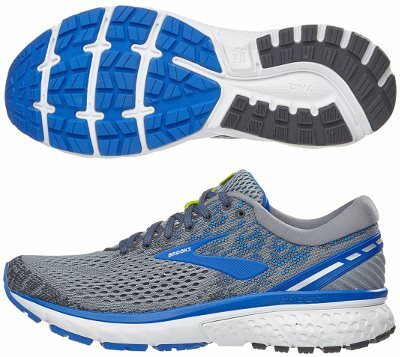 Brooks Ghost 11 are neutral cushioned running shoes. Target market for Brooks Ghost 11 is a challenging one because of broad runners base and competitor brands typically offer great value for money (although at increasingly higher price) with best selling running shoes like Nike Air Zoom Pegasus 35 or Adidas Solar Glide. So Brooks opts for solid running shoes made with high quality materials where new developments are being introduced from time to time to improve overall performance in both daily training and long distance road racing. As usual, there is a Gore-Tex® (GTX) edition available for extreme weather conditions. There are many changes from its predecessor Ghost 10 and at levels. Upper gets upgraded to new mesh that unfortunately is not premium FitKnit available in its bigger sibling Levitate 2 but flexible enough for dynamic adaptation and featuring large ventilation holes in forefoot to improve breathability. Interior comfort and well padded heel collar remain at same great level to meet high expectation. Maybe the most interesting point in Ghost 11 is the integration of the DNA LOFT foam (premiered in flagship Glycerin 16) in external side of rear area for softer shock absorption, something that will be appreciated particularly by heel strikers. Rest of midsole is made of reliable BioMoGo DNA so there is no change in dynamic performance nor responsiveness. Outsole keeps Omega Flex Grooves in forefoot for enhanced flexibility that promotes smooth transition while lugs have been simplified to prevent embedded debris.